August 1944: after months of hard fighting, the Allies are finally out of Normandy. In front of them, the Wehrmacht has all but disintegrated, having stood its ground up until breaking point. Supply is now the biggest concern for the Allies. Taking the large port of Antwerp will allow them to freely operate their vast armies and air forces in the months to come. Check out the blue dots just north of Évreux: center of the map, right behind that panzer IV. Those are stragglers: routed enemy elements trying to make their way back to their HQ. We’ve talked about the idea of stragglers in our very first dev diary. The blue icon shows their approximate strength in steps, and the orange symbol on the 3-step straggler is important – but read on. Take care, and AMA in comments as usual. I really like this type of detail. Is there any chance of this sort of thing being retrofitted to the original UofC, or a re-release of OofC with the new features, new scenarios, etc? I love how the fog of war seems to work, and the intel-straggler dynamic feels right! Simple abstraction of of reality = The UoC brand. The original UoC starts with a hard scenario. I wonder how the difficulty will be on the different maps on the western front. I’m kind of worried that allied numerical superiority make many scenarios very one-sided. My guess is that Tomislav will make the new map for the eastern front, but leave the scenarios and campaigns for the more creative users. I hope they do an eastern front add-on eventually though. Amazing work! It’s good to see all the new mechanics in play and illustrated. Just curious, have you guys finalised any plans on how to implement the Independent Brigades that served with the British forces, i.e. the 6th Guards Tank Brigade and 2nd Parachute Brigade? Apologies if this has already been discussed! 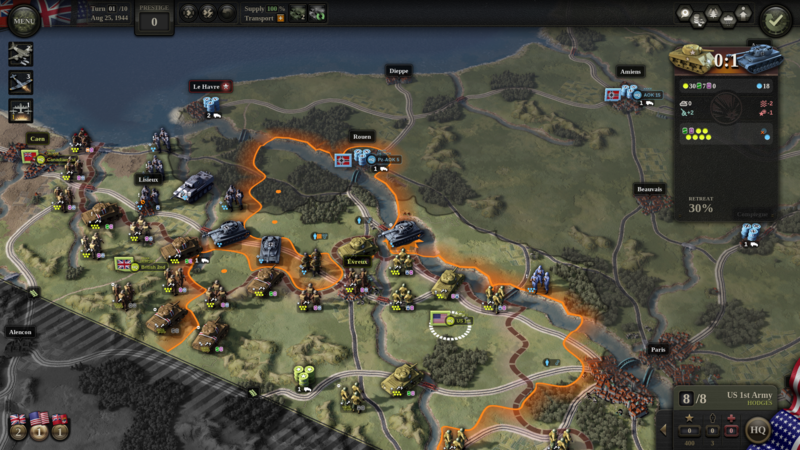 @Christopher: as Benjamin says, there will be an “official” eastern front expansion for this game eventually. It will take us a little while to work to get there though, as the war in the east was *huge*. @Ben: the problem has been noted, discussed here, and I haven’t made a decision either way :/. The options are to a) simply have them be low step-count units, perhaps loaded with specialists for survivability, b) allow for splitting of division-size units at the player’s choice (this is mostly for US CCA/CCB etc) or c) not have them at all, but rather model them as 1 or 2 specialist steps. This will be the defining wargame of the century I predict. Clearing all the map from enemy units and capturing all enemy flags was a source of fun (in many games) for completionist wargamers although not realistic. So I never looked to wipeouts as a problem. Nevertheless including unique mechanic feels refreshing and if it has significant trade-offs in decision making even better. Looking forward to try it out. Operation Compass comes to my mind instantly 🙂 I guess most of the North African theatre is not much of your interest due to focus on a divisional scale with more rather than fewer units. Speaking of big screenshot it was hard for me to realize which unit is selected looking only at the map (neglecting comparison screen). Town string obscures the view and I figured it is the Sherman because Pz IV is clearly indicated as aimed at. 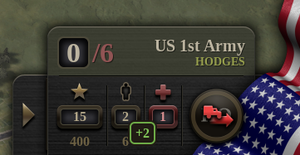 In a fraction of a second, I even thought it was HQ that was selected (but they are highlighted when unit they control is selected). Theater assets look weird, it reminds on C-47 with two engines more than it should have (but it is probably DC-4 instead) for tactical bombing and German fighter for strafing runs? Will there be a call out for beta testers when the time comes? @uran I think there is an animation making the selection more visible (below) than the static image suggests. @uran21: yes… though poster “glum” has a point: selection is animated, and therefore more visible than it seems. Also, map labels can be turned off, or set to “objectives only” which is what I find most practical. Theater asset buttons are still placeholders ofc, no worries. looking great, really looking forward to. it’s weird though that the moving tank feels as if animation is lacking probably due to… the tanks in civilization 6? i know it is a weird comparison, how different those games are, and how expensive animations can be, but i suppose that it is due to the 3d turn based combat and 3d board game feeling of units, and how well civ6 is animating and doing combat. it’s like changing the visuals and all the sudden being attractive to a new player base.